Healthy eating vs dieting … the eternal struggle! In this episode, I explore the different seasons of my life in terms of my relationship with food, in a way that I hope will show you that you’re not alone in the confusion between these two concepts. I agree! A balanced diet, with lots of fresh, seasonal ingredients, cooked simply and seasoned with a bit of imagination will keep you and your family healthy, happy and energized. For me, healthy eating is also about avoiding all the substances we know have invaded industrial food, that can send our bodies out of balance. Excess sugar, excess fats, excess chemicals… We don’t need them. Note the word “excess” – this is the key idea, the excess is what you’ll want to avoid. However, I will never say you must be a vegan or follow a paleo lifestyle, or something like that. With all my work as Glow Chef, my goal will always be to help you implement the decisions you choose to make about the way you eat. And to empower you to take all the decisions about your food into your own hands, because if you are a little bit what you eat, why should you outsource that to the unknown? 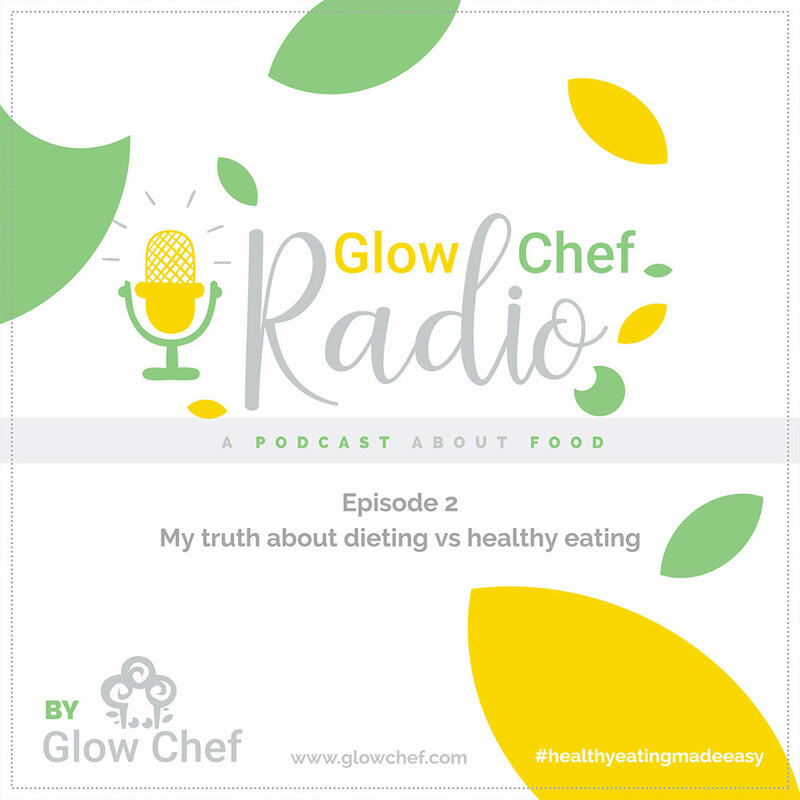 You should listen to the second episode of Glow Chef Radio if you’re curious about my history with food and healthy eating. It’s also available on Apple Podcasts and Spotify. Your FREE download: I’ve prepared 4 new small meal recipes for you, based on food combining principles that worked well for me in the past. And please let me know what you’re thinking about the show!